If you reclaim your power then it will feel like a rebirth–a renewal. It can feel like you’re a new person but you aren’t. You are simply whole. You’re not denying an aspect of yourself to please others. I know. I have done this on numerous occasions and have only now reclaimed my own power and it can be hella scary! I constantly worry about what others will think, if I may lose someone because they don’t agree with my path but that’s their problem. Not mine. I cannot masquerade as someone I’m not simply to make them feel better. So, my friends, focus today on reclaiming your personal power, what that means to you, and have it can help you sort of go through a cycle of renewal and newness. What are some things you can do daily to help acheive this new stage? No one said it was easy but it’s worth it. Looks like there were two necessary messages for today and I actually am digging the vibe of these two cards. Every day is a chance to change, an opportunity to say “this isn’t who I want to be/am and this isn’t the life I want!”. Just as each sunrise is abundant with powerful potential, it also signifies rebirth which only furthers this idea. A makeover doesn’t happen overnight but you can make that first step at any time. You needn’t be held back by the past. We see with the DNA card, two snakes which have always been symbols of regeneration and rebirth-shedding the old skin for the new. This card doesn’t only further the concept of rebirth but itself has two incredible messages for us on its own. We are being reminded that we are comprised of dual aspects-our earth bound self and our spirit that comes from and is connected to Spirit. In alignment with Rebirth, we are being guided to find a balance of both these selves. Focus on our higher good, finding a closeness to Spirit while remaining grounded and practical. Easier said than done. It could mean simply having faith in Spirit while working on improving this life. When I first saw this card I thought of the ancestors. Ask for their guidance and help in this endeavor. This seems to be some powerful energy here, my friends. Happy Solstice Eve! I meant to write this post Sunday which is the day I typically assign for posting the week’s post but this week has been absolutely chaotic, including me losing my drive for a bit. It’s back though and I’m ready to go! 🙂 As you know, Yule focuses on the rebirth of the Sun God who gave His life during the harvest season so that we may survive the winter. It’s about bringing light back into the dark and from tomorrow until Litha, the daylight will begin growing with the sun once more peaking on the Summer Solstice which is the longest day of the year. Then we repeat the cycle. However, to really embrace this spirit of rebirth and renewal, we must be prepared to do the necessary work tonight. It definitely helps that Yule lasts for three days which allows others the comfort of being able to celebrate on one of the other two should they be unable to celebrate on the actual Winter Solstice day itself. I’ll be taking advantage of this three day span to fully release, purify, and invoke–all of which I’ll discuss momentarily. Instead, we must do the prep work and really observe and notice our Shadows which is good for tonight. 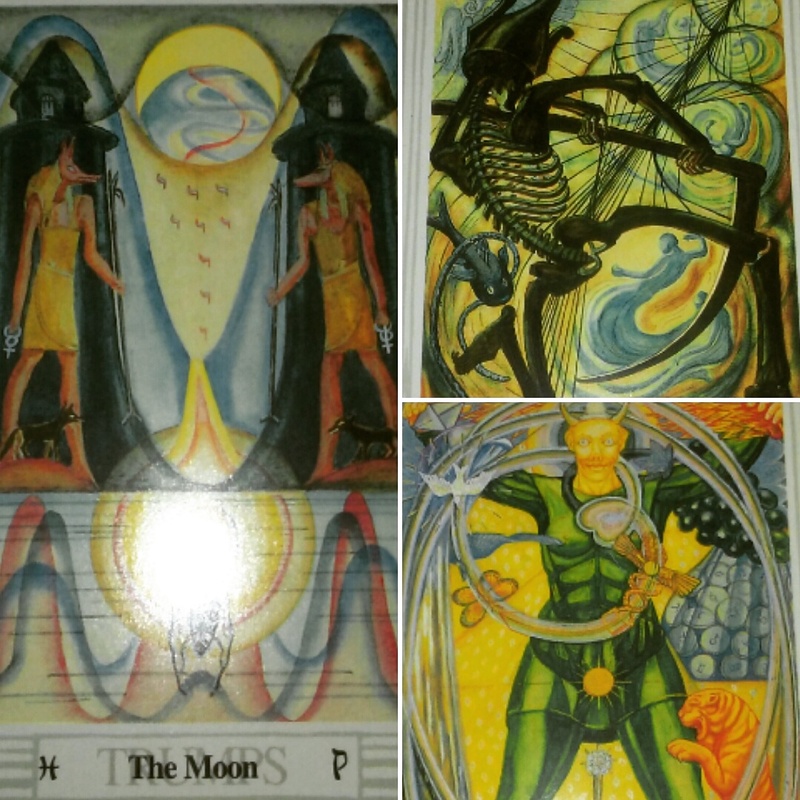 I’m always reminded of The Moon card of the Thoth Deck which almost seems to me to be asking whether we’re prepared to enter this darkest night, do the Shadow work, so that we may emerge into the light renewed and prepared. Not only must we face our Shadows but its also important to remember that now is the time to determine that which no longer serves us. What have we been conditioned into believing and accepting that doesn’t fit? This has always been my major issue as I’ve always desired to conform to the ideals of my family as I wanted nothing more than to be accepted. I’ve always been eccentric and drawn to the occult, to witchcraft, and to things considered odd in my family. Growing up, I was always the outsider who very much wanted to belong which led me into the Shadow of people pleasing. I was terrified to embrace myself as that goal would never manifest. As I grew older I learned how silly this was–if they wouldn’t accept me unless I forced myself to deny my own personality then I had no use for them. This is one of my goals for 2017: to stop people-pleasing! beginning, a rebirth, as now you’ll feel fresh and rejuvenated. Ah…so nice! 🙂 I’m not sure about you but 2016 has been one heck of a doozy that I can’t wait to leave behind! This makes this Yule celebration particularly crucial as I just feel heavy with the energetic grime of the year! 2017 is a 1 year in numerology as well which is all about NEW BEGINNINGS so let’s make it one hell of a year, hmm? With all of this talk about the personal aspect of Yule, it’s good to remember to also celebrate the rebirth of the God, spend time with our loved ones, as well as drink and be merry! I didn’t draw a card as normal for today because I instantly had these three come to mind as soon as I woke. Tonight is Yule Eve, with tomorrow being Yule or the Winter Solstice–the rebirth of the God (the Sun). In order to be reborn ourselves and really work with these themes, we must be willing to face the longest, darkest night of the year. We must face our shadows so that we may release and let go all that which no longers serves us. 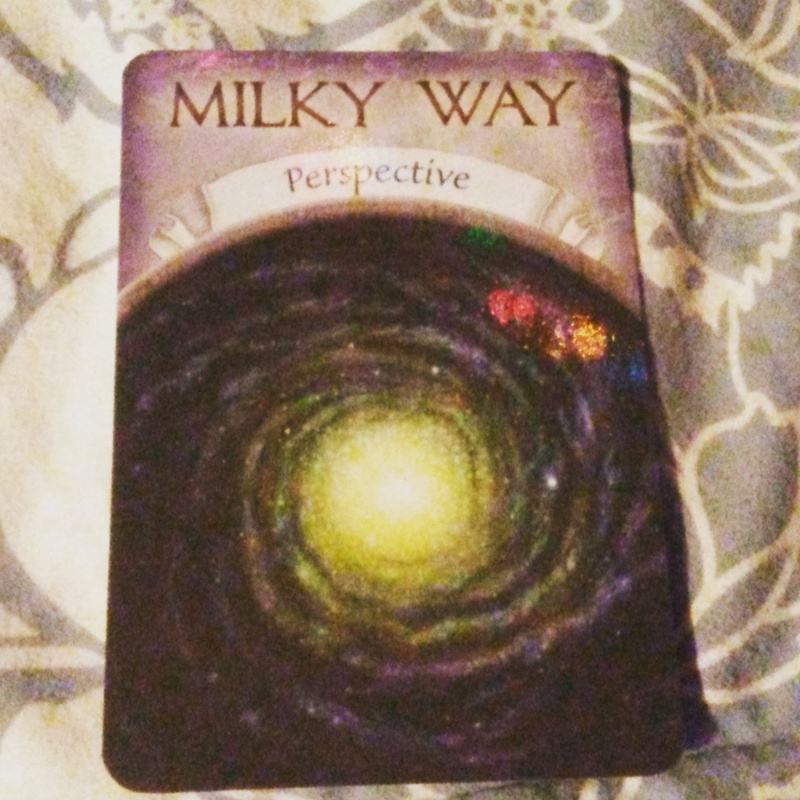 This is why I chose the moon card first off as the imagery perfectly represent this necessary will to traverse between the pillars, into the darkness, so that we may emerge into the light renewed and energetically cleared. The moon also allows us to peer through the illusions and into those dark places so that they may be illuminated. It is no use to merely sweep the shadows beneath the rug and ignore them because eventually you will have to face them. As we do this necessary work, as we release and banish that which we no longer want, deserve, or need, we must also purify ourselves so that we may welcome the new. This is a great time of transformation which is why the Death cars came to mind. We are dying to the old so that we may be reborn to the new. As within, so without. We’re extensions of what is occurring in nature at this time. As we prepare to face the longest, darkest night of the year, we must release that which no longer serves us. However, to do this we need to shift our perspective wo that we objectively are capable of viewing and understanding what all that entails. There is no blame, no regret, no self-scolding but think instead of this being an act of self-care. Just take a deep breath and step back. Shift your point of view. It’ll help. This can and should be applied whenever possible and would be one way to help ease any holiday anxiety.